This weekend was pretty darn epic! I spent some quality time with two ladies I have been friends with since jr. high. The fact that our friendships are still alive after all of these years is pretty impressive. To kick off the weekend I received an amazing package from my Weekend Update co-host, Dana. She's the BEST! She sent me a "Keep Calm and Drink On" book and sticky tabs to take note of my favorite drinking quotes. How sweet is that?! It totally set the tone for a great weekend. Let's start with Friday night. Tiffany, who you may recognize as the wonderful woman behind Polka Dotted Cats, and I had a 90s reunion - the Summerland Tour. Sugar Rey, Everclear, Gin Blossoms, Lit, and Marcy Playground all in one night at The Greek Theater here in LA. It was a bit cheesy at times but it was fun and I'm really glad we went! Then on Saturday, our friend Kathrin joined us for a surprise birthday gift to her - a trip to Agua Dulce Winery near Santa Clarita for some tasting and lunch. Before we headed to the winery we stopped at Saddle Ranch on the Sunset Strip for breakfast. I guess it's customary to give out HUGE orders of cotton candy to guests so we had fun playing with the sugary goodness. Finally we headed out to Agua Dulce where we did a wine cellar/tasting tour. It was really cool! As we talked about the wine making process we were given 4 tastes along the way. Then we were able to sample the wines again before deciding which one we wanted to enjoy with our lunch (which they provided). If you live in the Southern California area and want to go wine tasting I highly suggest Agua Dulce Winery. Just let them know you want to take advantage of their Groupon deal: $20 a person for a tour, tasting, and lunch. Great value! What did YOU do this weekend? 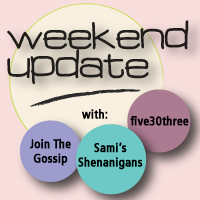 Join the Weekend Update blog hop hosted by me and my lovely friends Dana of five30three and Sami of Sami's Shenanigans! Just PLEASE follow these rules: blog about your weekend, link to the specific post, include our button in the post, and add your name to the list below. Pretty easy, right? Sounds like fun! A lot better than how I spent my weekend (studying) haha! Looks like you had a great weekend with great friends! I love surprises in the mail--how fun! wow, that weekend is seriously epic! The Summerland Tour concert sounds like it would take me back to my Junior High days! What a fun package and concert!!! I'm sure the songs brought back great memories! I should have known you already wrote it! Did those old dudes hold up ok for an entire set? Hahaha! Cotton candy for breakfast? Sounds like my kind of place! I love that you pet all kinds of animals, especially a ram! So sweet! What a fun weekend! I didn't even know they had wineries in SoCal! Do you miss tiny horse? I bet he misses you too...HAHAHA! Also, were you thinking they are called shetland ponies? I thought of that driving home! Fireflys 4 life! I am fairly certain that you NEED to buy yourself a tiny horse. How fun would it be to commute around LA on that? My faith in the USPS has been restored after you received your package so quickly. I'm glad you liked the book and that it kickstarted your weekend off right! It sounds like a wonderful weekend - a wine tasting tour is such a cool way to spend a day! You look gorgeous, as usual. That winery looks gorgeous, sounds like so much fun! I love your hat too! That cotton candy looks super tasty and I am usually not a fan. But those sticky tabs are super fun and I'm sure you'll find lots of ways to use them. Also, I am still close with my two friends I met when I was about 10 and isn't it awesome to have people who've been in your life for longer than they haven't been? I am always amazed by that and just love that we're all so lucky to still be around for each other! I'm still BFFs with my middle school friends too! It's awesome :) Sounds like you girls had a blast! Love the package you got, so cute. What a fun weekend! well it certainly looks like you had a fun & action packed weekend! Wineries are the best, and I'm jealous that you have an abundance of them out in Cali. And free cotton candy? umm YES PLEASE! If I lived closer, I would have totally been there with you for that concert! How fun. And what a sweet surprise for your friend, what girl doesn't love a winery!! Glad you ladies had a fun-filled weekend! I love following along on your IG! have a great week!! I haven't been to a wine tasting in a long time. I miss them! Thanks again for a great bday gift!!! it was a preety awesome weekend!!! sounds like a great weekend! Definitely one of my "to-dos" this weekend is go wine tasting with my girlfriends!! Sounds like a great weekend!! Wine tasting... I want to do that soon! I went to a winery too! Such a fun summer activity! And I'm loving those cotton candy pictures. Haha. This looks like such a fun weekend! I am pretty jealous that you went to that concert though... sounds like a bunch of awesome bands all together! :) Glad you had such a good weekend! Your weekend looks like a blast, and you look adorable in your hat! I want to click my heels together and be in SoCal RIGHT now!! ;) A cheesy 90's concert is my idea of fun :) Love all the pics, the cotton candy ones are so fun! Looking at the winery pics takes me back to when Claire took us to Napa Valley and we had such an AMAZING time! I felt like I was in Italy! And yay for the incredible Groupon deal! p.s. love that you ladies have been friends since jr. high! SO special! That winery looks like so much fun!! I've always wanted to go to one! i'm still mighty impressed with the ginorm cotton candy. holy cavity goodness!!! the blue cotton candy looks so good heheh..
Aww, this sounds so amazing! It's been such a long time since I did a wine tasting and I really miss it! Thanks for the inspiration! Looks like a fantastic weekend! Love it! Aww looks like you had such a fabulous weekend with your girlfriends. Old friendships like that are the absolute best! Sounds and looks like an amazing weekend, and I so want cotton candy now!!! I LOVE the Gin Blossoms! I have to go see them when they are in town! It looks like you had a fab weekend! 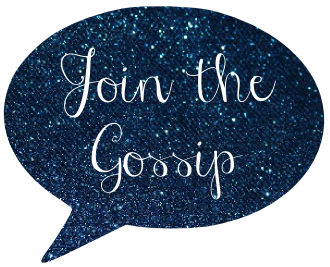 Rellas Bellas: Launch & Discount! Gwen's Still Got It - Settle Down!